The feline leukaemia guidelines were published in J Feline Med Surg 2009, 11: 565-574 and updated in J Feline Med Surg 2013, 15: 534-535 and in J Feline Med Surg 2015, 17, 570-58. This update has been compiled by Regina Hofmann-Lehmann et al. Feline leukaemia virus (FeLV), a retrovirus, does not survive for long outside the host and is readily inactivated by disinfectants, soap, heating and drying. Though transmission via fomites is unlikely, it will retain infectivity if kept moist at room temperature (cave: iatrogenic transmission!). Infections occur worldwide, but the prevalence and importance of FeLV in Europe have decreased thanks to reliable tests, programmes to segregate viraemic carriers, understanding of FeLV pathogenesis and the introduction of effective vaccines. Viraemic cats are the source of infection, with shedding in saliva, nasal secretions, faeces, and milk. Risk factors are young age, high population density and poor hygiene. Transmission occurs mainly through friendly contacts like grooming. Common disease consequences of progressive infection (=persistent viraemia) are immune suppression, anaemia, and lymphoma; prognosis in these cats is poor, and most will have died within three years. However, with proper care and an indoor-lifestyle, some cats may live much longer. The cat’s age at the time of the virus exposure is the most important determinant of the susceptibility for infection and clinical outcome, with kittens being most susceptible. Infection management includes separation measures following laboratory diagnosis (detection of viraemia), treatment and vaccination. All cats at risk of exposure should be vaccinated, kittens at the age of 8 or 9 weeks and again at 12 weeks, together with core vaccine components. In order to avoid “vaccine failures” and unnecessary vaccinations any cat should be tested for antigenaemia and preferably also for FeLV provirus before vaccination. Feline leukaemia virus (FeLV) is a gamma retrovirus affecting domestic cats worldwide; it was first detected in 1964 by electron microscopy (Fig. 1), after experimental transmission of cell-free material (Jarrett et al., 1964). FeLV also infects small wild cats including Felis silvestris and European and Iberian lynxes, Florida panthers, the Chilean wildcat (Leopardus Guigna) and Jaguarundis (Puma yagouaroundi) of Central and South America (Leutenegger et al., 1999; Cunningham et al., 2008; Meli et al., 2009; Filoni et al., 2012; Mora et al., 2015; Silva et al., 2016). Retroviruses are enveloped RNA viruses and rely on a DNA intermediate for replication. The single-stranded RNA genome is reverse transcribed into DNA, which is usually incorporated into the host cell genome through an integrase (Temin and Mizutani, 1970). 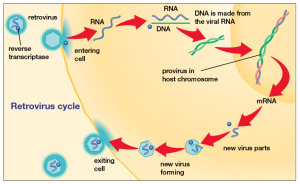 The integrated DNA is known as the “provirus”. 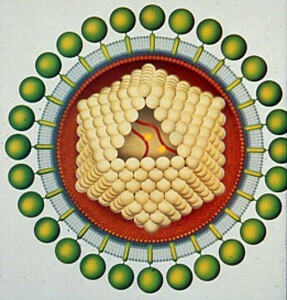 After reverse transcription, synthesis of viral proteins occurs according the conventional mechanisms of transcription, with virion assembly taking place near the cytoplasmic membrane and budding from the cell surface (Coffin, 1979). Infection by a retrovirus usually does not lead to cell death (Fig. 2). The FeLV genome contains three genes coding for the structural proteins of the virus (Fig. 3): the group specific antigen (gag) gene, including p27; the polymerase (pol) gene coding for the reverse transcriptase, protease and integrase; and the envelope (env) gene coding for the glycoprotein gp70 and the transmembrane protein p15 E (Coffin, 1979). Besides this “exogenous” FeLV, in the domestic cat two forms of endogenous gamma retroviruses are known: the endogenous feline leukaemia virus (enFeLV; Soe et al., 1983) and the RD-114 virus (Sarma et al., 1973). The enFeLV is thought to have originated hundred thousands of years ago in cats that had eaten mice viraemic with a murine leukaemia virus (MuLV), which was able to incorporate its genome into the germ line DNA of the predator. This MuLV was then inherited by all offspring. The amount of enFeLV varies between breeds of cats, including Felis silvestris, suggesting that this recombination with MuLVs is a continuing phenomenon (Tandon et al., 2007). The enFeLV genome is incomplete and therefore does not replicate (Soe et al., 1983). The RD-114 virus is of primate origin, replication competent, and thought to have originated hundred thousands of years ago from an ancestor cat that had preyed on an early primate infected with this virus. Feline cells are not susceptible to infection with the RD-114 virus, and it is not pathogenic for cats (Barbacid et al., 1977). Some years ago, concern was raised when infectious RD-114 virus was detected in commercially available live attenuated vaccines for cats and dogs produced on certain feline cell lines, such as CRFK cells (Miyazawa et al., 2010). In cats the risk of adverse effects after using a vaccine containing RD-114 is probably low, as endogenous retroviruses can be considered non-pathogenic for their original host. The risk of RD-114 through off-label use of live attenuated cat vaccines in non-domestic felids, however, is unknown. FeLV exists in the subtypes A, B, C, and T (Russell and Jarrett, 1978; Anderson et al., 2000) that are antigenically closely related. The subtype A is ubiquitous and involved in every infection, whereas subtype B develops within an FeLV A-infected cat from recombination of FeLV A with enFeLV. Subtype C is the result of mutations in the env gene, and subtype T has a tropism for T lymphocytes. FeLV does not survive for long outside the host as it is destroyed readily by disinfectants, soap, heating and drying. Transmission via fomites is unlikely. The virus will survive, however, if it is kept moist at room temperature, so there is a potential for iatrogenic transmission via contaminated needles, surgical instruments or blood transfusions. FeLV occurs worldwide. Its prevalence may be influenced by the density of cat populations, and there may be noticeable geographical and local variation. There is little reliable information on the current prevalence of FeLV in different countries. The prevalence of FeLV infection in Europe and North America has greatly diminished; in individually kept cats it is low, often – but not everywhere - less than 1% (Hosie et al., 1989; Lutz et al., 1990; Levy et al., 2006; Little, 2011; Englert et al., 2012). In large multi-cat households without specific preventive measures for introduction of FeLV, the prevalence may be greater than 20 %. Recently, FeLV infection was shown to be still quite prevalent in North-Western China with over 11 % of cats tested (Cong et al., 2016) and in Thailand with almost 25 % of cats tested (Sukhumavasi et al., 2012). Over the last 25 years, the prevalence and importance of FeLV infection in Europe has diminished due to the availability of reliable tests, the test and removal programmes initiated, improved understanding of the pathogenesis and the introduction of highly efficacious FeLV vaccines. FeLV-viraemic cats act as a source of infection. Virus is shed in saliva, nasal secretions, faeces, and milk (Hardy et al., 1976; Pacitti et al., 1986). Risk factors for infection are young age, high population density and poor hygiene (Figs. 4, 5). FeLV infection is transmitted mainly by mutual grooming, but also through bites. In viraemic queens, pregnancy usually results in embryonic death, stillbirth or, rapid fading away in FeLV-viraemic kittens. In regressively infected (see later) queens, usually transmission does not take place during pregnancy. However, rarely some (but not all) kittens of these queens may become viraemic after birth (Pacitti et al., 1986). In these instances, transmission takes place from individual mammary glands where the virus can remain latent until the mammary gland develops during the last period of pregnancy. Young kittens are especially susceptible to FeLV infection, while with age, cats become increasingly resistant, especially to progressive infection (Hoover et al., 1976; Grant et al., 1980). Although aged cats are generally accepted to be more resistant to infection, they can still be infected providing the challenge is sufficiently severe. In most cases, infection starts in the oropharynx where FeLV infects individual lymphocytes that are transported to the bone marrow. Once the rapidly dividing bone marrow cells become infected, large amounts of virions are produced, and as a consequence viraemia develops within a few weeks of infection. Early in the infection, mainly lymphocytes and monocytes, later during viraemia mostly neutrophils become infected (Cattori et al., 2008). Often viraemia may develop several months after continuous exposure to shedding cats (Lutz et al., 1983b). Viraemia leads to the infection of salivary glands and intestinal linings, and virus is shed in large quantities in saliva and faeces (Rojko et al., 1979). Frequently, the development of viraemia as well as establishment of a progressive infection may be overcome by a functioning immune system (transient viraemia) (Lutz et al., 1980a). Such cats (so-called regressively infected cats) are generally not at risk of developing disease. 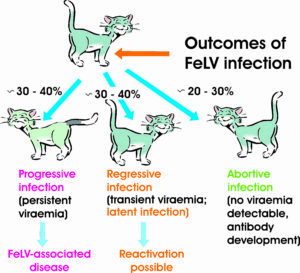 In a multi-cat household without control of FeLV infection, 30-40 % of the cats develop persistent viraemia (progressive infection), 30-40 % exhibit transient viraemia (regressive infection) and 20-30 % develop antibodies without ever being detectably viraemic (abortive infection) (Fig. 7). A smaller proportion (~5 %) exhibits an atypical course of infection, displaying antigenaemia but no or only low-level viraemia (Hoover et al., 1977; Lutz et al., 1983b). A cat that has overcome viraemia remains regressively infected. From some cells that remain provirus-positive, infectious virus can be recovered when for instance bone marrow cells are kept in culture in the presence of glucocorticoids for several weeks (Rojko et al., 1982). Regressive infection is common. In Switzerland and Germany, up to 10 % of the feline population prove to be provirus-positive and antigen-negative (Hofmann-Lehmann et al., 2001; Boretti et al., 2004; Englert et al., 2012). Reactivation may take place in vivo particularly when regressively infected cats experience immune suppression or chronic severe stress (Boretti et al., 2004; Helfer-Hungerbuehler et al., 2015). It is not clear how often this happens under field conditions, but it is estimated to occur in about 10 % of regressively infected cats. Caveat: Attention should be given to the fact that during blood transfusion FeLV infection can readily be transmitted to recipient cats also if the donor cat is regressively infected, i.e. is negative for p27 antigen, but positive for FeLV provirus (Nesina et al., 2015). It is likely that no cat can completely clear FeLV infection from all cells (Helfer-Hungerbuehler et al., 2015). This might explain why virus neutralising antibodies persist in cats recovered from viraemia for many years in the absence of overt infection or exposure to viraemic cats. Cats with regressive infection appear to have the same life expectancy as cats that have never been exposed to FeLV. However, proviral DNA has been found in the tumours of ostensibly FeLV-free cats (Jackson et al., 1993), suggesting that the virus might be involved in an early event in the pathogenesis of the tumour and then persist only as a provirus, possibly in a defective form. Local foci of infections may also be the source of the FeLV p27 antigen that is sometimes found in the plasma of cats, from which infectious virus cannot be isolated, cats with ‘discordant’ FeLV test results. The typical clinical signs of FeLV infection usually develop in cats with progressive infection, often not until after several years of viraemia (Hardy et al., 1976; Helfer-Hungerbuehler et al., 2015). Experimentally, susceptible kittens can be protected from FeLV infection following passive immunisation with high titred antisera against FeLV (Hoover et al., 1977). This observation suggests that antibodies have a role in providing protection. However, once progressive infection has become established, this treatment is ineffective (Weijer et al., 1986). Most cats that overcome FeLV viraemia exhibit high virus neutralising antibody titres (Russel and Jarrett, 1978; Lutz et al., 1980a); antibodies are directed against all components of the virus (Lutz et al., 1980a). In most - but not all - cats that overcame viraemia, virus neutralising antibodies can be detected (Flynn et al., 2002). Since not all immune cats develop high antibody titres, it was concluded that cytotoxic T-lymphocytes (CTLs) are also important in FeLV immunity (Lutz et al., 1980a). Indeed, CTLs specific for FeLV appear before virus neutralising antibodies, and following adoptive transfer of FeLV specific CTLs stimulated in vitro, the viral load in FeLV viraemic cats could be lowered (Flynn et al., 2002). Antibody development was observed in some cats as the sole evidence of FeLV infection (Major et al., 2010). These cats had been exposed once intranasally to very low doses of FeLV (10,000 FFUs). Since some of them developed antibodies, it was concluded that the virus had replicated somewhere to sufficient levels to trigger antibody synthesis. The observation that PCR analysis of several organs was negative indicates that further replication must have been controlled by the immune system. FeLV infections can cause variable and multiple clinical signs. The most common disease consequences of progressive FeLV infection are: immune suppression, bone marrow suppression, and lymphoma (Hardy et al., 1973, 1976). The prognosis for cats with progressive FeLV infection is poor, and most will develop clinical signs typical for this infection. Some progressively infected cats may remain healthy for years before an FeLV-related disease develops, and occasionally some enjoy lifelong health (Hofmann-Lehmann et al., 1995; EBM grade III). The cat’s age at the time of the infection is the most important factor determining the clinical outcome (Hoover et al., 1976; EBM grade III). Viral and host factors, like the virus subgroup and the cell-mediated immune response, influence the pathogenesis in individual cats. Immune suppression in FeLV infected cats is more complex and severe than the more selective one caused by feline immunodeficiency virus (FIV) infection. Abnormalities reported include thymic atrophy, lymphopenia, neutropenia, impaired neutrophil function, loss of CD4+ and of CD8+ cells (Ogilvie et al., 1988). Whether clinical signs are present or not, every cat with progressive FeLV infection is immune-suppressed (Perryman et al., 1972; Orosz et al., 1985a, 1985b), with delayed and decreased primary and secondary antibody responses. The immune suppression may have diverse clinical consequences and may allow infection with agents to which cats would be normally resistant, such as mycobacterial infections. In addition, there may be exacerbation of disease caused by other pathogens, such as poxvirus, haemotropic mycoplasmas and Cryptococcus species, and of infections normally not pathogenic in cats, e.g. by Toxoplasma gondii. Concurrent FeLV infection may also predispose to chronic refractory disease, such as stomatitis and chronic rhinitis (Knowles et al., 1989; Tenorio et al., 1991). Chronic rhinitis and subcutaneous abscesses may take much longer to resolve in progressively FeLV-infected cats, and unexpected recurrences may arise. FeLV-infected cats may develop many different types of anaemia (Fig. 8); most of them are non-regenerative and only few are regenerative. Regenerative anaemias, associated with haemolysis may be related to secondary opportunistic infections, for example by Mycoplasma haemofelis, or to immune-mediated destruction of red blood cells (Scott et al., 1973; Kociba, 1986). FeLV-C can interfere with a haem transport protein (Cotter, 1979; Quigley et al., 2000), which directly results in a non-regenerative anaemia. Non-regenerative anaemias may be caused by the direct bone marrow suppressive effects of the virus, chronic inflammatory mechanisms, or myeloproliferative disease. Other cytopenias may be present, e.g., thrombocytopenia and neutropenia, caused by the same mechanisms. FeLV may cause different tumours in cats, mainly lymphoma and leukaemia, but also other non-haematopoietic malignancies. Lymphomas are among the most frequent tumours of the cat and are sometimes caused by FeLV infection (Francis et al., 1979a; Louwerens et al., 2005). However, it should be noted that today the vast majority of lymphomas are not associated with FeLV. 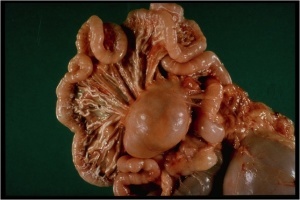 the atypical or extranodal form, presenting with solitary tumours in kidneys, CNS, or skin. In some cases, lymphoma is disseminated with multiple organ and site involvement (Hardy et al., 1970; Reinacher and Theilen, 1987). Liver, spleen, bone marrow, blood and/or non-lymphoid organ involvement are associated with a poorer prognosis (Vail and Thamm, 2005). Different types of acute or chronic leukaemia have been described depending on the neoplastic transformed cell type. Multiple fibrosarcomas in young viraemic cats have occasionally been associated with infection with FeSV (feline sarcoma virus), a recombinant virus developing from recombination of the FeLV-A genome with cellular oncogenes (Hardy, 1981; Donner et al., 1982; Besmer, 1983). FeSV-induced fibrosracomas have to be differentiated from feline injection site sarcomas (FISS) that are not related to either exogenous or endogenous FeLV or FeSV infection (Ellis et al., 1996; Kidney et al., 2001). Benign peripheral lymphadenopathy has been diagnosed in FeLV-infected cats (Moore et al., 1986); a clinical picture with potential to be mistaken as peripheral lymphoma. Chronic enteritis associated with degeneration of intestinal epithelial cells and crypt necrosis has been associated with FeLV-infection in cats in which virus was present in intestinal crypt cells (Reinacher, 1987). 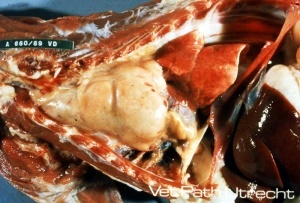 Inflammatory and degenerative liver disease has also been described in association with FeLV infection (Reinacher, 1989). Neurological diseases not associated with CNS lymphoma or secondary CNS infections have been described. They mostly occur as peripheral neuropathies presenting as anisocoria, mydriasis, Horner’s syndrome, urinary incontinence, abnormal vocalization, hyperesthesia, paresis and paralysis (Haffer et al., 1987). Neuropathogenicity has been considered as a possible direct effect of the virus (Dow and Hoover, 1992). Immune-mediated diseases associated to FeLV infection have been reported, including immune-mediated haemolytic anaemia, glomerulonephritis, uveitis and polyarthritis. Antigen-antibody complex deposition and loss of T-suppressor activity may be the main factors contributing to immune-mediated diseases. Reproductive disorders and fading kitten syndrome have been also reported. Foetal resorption, abortion and neonatal death are the main manifestations (Hardy, 1981). Fading kittens and reproductive disorders are rarely observed today, largely as a result of the very low prevalence of infection in pedigree breeding cats. The first p27 enzyme-linked immunosorbent assays (ELISA) were based on polyclonal antibodies. Such tests had the advantage of allowing quantitation of p27 but had a tendency to produce false-positive results as the antibodies did not only detect viral proteins but occasionally also non-viral components (Lutz et al., 1980b, 1980c). Improved ELISA based on monoclonal antibodies to p27 were introduced later to detect p27 capsid protein of FeLV present in blood or serum (Lutz et al., 1983a, 1983b). This assay utilises a single monoclonal antibody specific for an epitope (A) of p27 fixed to a solid phase. The serum sample to be tested is mixed with one or two additional monoclonal antibodies specific for epitopes B and C of p27, and the mixture is then added to the solid phase. Hence the presence of p27 leads to insolubilisation of the enzyme-conjugated antibodies and the resulting colour change is indicative for the presence of p27, a marker of progressive infection or of transient viremia in some cats with the regressive form of infection during the early phase. 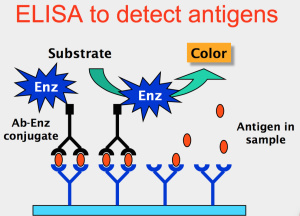 ELISA procedures have the advantage of high diagnostic sensitivity and specificity. These tests are based on the same principle as the ELISA but small beads less than one micron in size are coated to the revealing antibodies rather than enzymes. 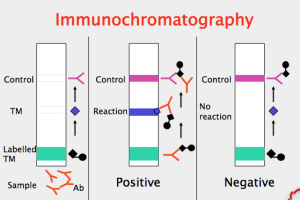 The diagnostic sensitivity and specificity of immune chromatography tests was shown to be comparable to those of the ELISA (Robinson et al., 1998; Hartmann et al., 2001, 2007; Pinches et al., 2007; Sand et al., 2010; EBM grade I). The first method that allowed FeLV detection in progressively infected cats under field conditions was the indirect IFA, introduced in 1973 (Hardy et al., 1973). It was based on the observation that granulocytes, lymphocytes, and platelets in progressively infected cats contain gag components, which may be detected by IFA in blood smears. Thus, it becomes positive later than the ELISA and only in the phase of the second viraemia, when bone marrow cells are infected. The diagnostic sensitivity of IFA is significantly less than that of the ELISA (Hawks et al., 1991; EBM grade I). If a progressively infected cat has leukopenia or if only a small percentage of peripheral leukocytes are infected, the presence of FeLV infection may be overlooked using IFA tests. 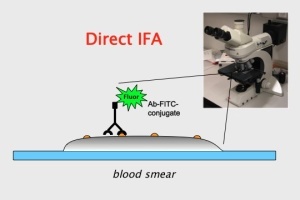 Furthermore, all eosinophils have a tendency to bind the FITC conjugates used for IFA resulting in false positive tests if slides are not read carefully (Floyd et al., 1983). Virus isolation in cell culture has been considered to be the ultimate criterion for progressive FeLV infection (Jarrett, 1980; Jarrett et al., 1982), but since the introduction of newer detection methods (Hofmann-Lehmann et al., 2001) it is rarely considered for routine testing. Since every cat cell carries between 12 and 15 copies of endogenous FeLV, it was difficult to determine sequences specific for detecting exogenous provirus in early research (Jackson et al., 1996). The value of PCR techniques was greatly enhanced by the development of highly specific real-time PCR assays that not only allow detection but also quantitation of exogenous FeLV provirus (Hofmann-Lehmann et al., 2001; Tandon et al., 2005). PCR procedures have the highest analytical and diagnostic sensitivity and a high specificity – provided the tests are run with precautions of clean work, using separate lab rooms to handle amplified products, with all necessary controls and under conditions of “good laboratory practice”. PCR for the detection of provirus in whole blood can be useful for the clarification of inconclusive p27 antigen tests. Moreover, PCR from whole blood may be helpful in the very early phase of infection. Provirus PCR from whole blood is positive earlier than p27 antigen detection (Hofmann-Lehmann et al., 2006). And finally, it may be applied in catteries to confirm absence of FeLV or identify regressively infected cats (provirus carriers) and it may be useful to investigate cats with clinical signs that may be FeLV-associated but that are antigen-negative. The detection of viral RNA added a new aspect to the diagnosis of FeLV infection (Tandon et al., 2005). Viral RNA present in whole blood, serum, plasma or saliva is detected by real-time reverse transcriptase (RT)-PCR. This technique permits the detection and quantitation of viral genetic sequences in the absence of cells. RNA RT-PCR does not provide the same information as DNA (provirus) PCR. Many cats that have overcome FeLV viraemia remain provirus-positive (regressively infected) but do not have detectable viral RNA in plasma, saliva or faeces (Gomes-Keller et al., 2006a). Detection of viral RNA in saliva is a reliable parameter of viraemia (Gomes-Keller et al., 2006b). The use of saliva as the substrate represents an alternative for assessing the infectious state of a cat without leading to unnecessary stress to the patient which usually resents blood sampling. Moreover, the sample collection does not require trained personnel. RT-PCR from plasma and saliva may also be helpful in the very early phase of infection. Detection of viral RNA by RT-PCR from plasma or saliva is positive as early as one week after FeLV exposure and with that earlier than p27 antigen testing and also somewhat earlier than provirus PCR from blood (Hofmann-Lehmann et al., 2006; Cattori et al., 2009). In most situations, individual cats are tested for FeLV infection. 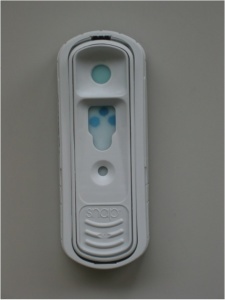 However, when the cost of testing is a limitation, pooled saliva samples can be used for RT-PCR, as the assay is sufficiently sensitive to detect a single infected cat in a pool of up to 30 samples. 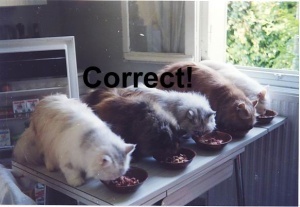 This approach may be chosen when screening multi-cat households (Gomes-Keller et al., 2006b). The observation that antibodies can develop as the sole parameter of exposure to FeLV (Major et al., 2010) led to the examination of various antibody tests against different antigens to assess their diagnostic usefulness. In contrast to published results (Fontenot et al., 1992) a recombinant preparation of FeLV p15(E) proved highly effective for the detection of antibodies induced by FeLV infection (Boenzli et al., 2014). Although antibodies against various FeLV components can be measured, the results are difficult to interpret because some cats develop antibodies to their endogenous FeLV. Therefore, such tests are currently of little clinical value, with the possible exception of p15E (Boenzli et al., 2014). Virus-neutralising antibodies can be measured, but this test is not widely available (except in the UK) and is used infrequently. In some research laboratories, the so-called FOCMA (feline oncornavirus-associated cell membrane antigen) test was used to detect antibodies to what was believed to be a tumour-associated antigen. It was later found that FOCMA was indeed a combination of several viral components (Vedbrat et al., 1983). As this test is difficult to establish and to standardise, it is not considered to be of clinical value. 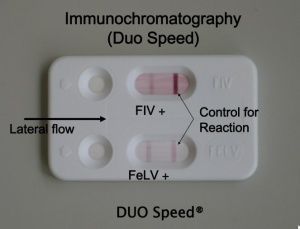 The first tests that become positive after experimental FeLV infection are usually virus isolation and RT-PCR for the detection of viral RNA, followed within a few days by DNA (provirus) PCR, then ELISA, and later by IFA (Hofmann-Lehmann et al., 2006). Cats with progressive infection are usually positive in all those tests. The most widely used in-practice tests are antigen ELISA and immunochromatography tests. As the prevalence of FeLV infection has decreased in many European countries, also the percentage of false positive test results tend to increase. Therefore, a positive result in a healthy cat should always be confirmed, preferably using provirus PCR offered by a reliable laboratory. A positive ELISA or immunochromatography result in a cat with clinical signs consistent with FeLV infection is more reliable, as in sick cats the prevalence of FeLV is considerably higher, and the higher the prevalence the higher the probability of a test to be correctly positive. Cats in which an antigen-positive test result has been confirmed can overcome viraemia (regressive infection) after weeks, usually by twelve weeks – in rare cases even later; in one documented case more than a year after infection (Hofmann-Lehmann et al., 1995). Therefore, every antigen-test-positive healthy cat should be separated and retested after 6 or more weeks; if the cat still tests antigen-positive retesting can be repeated. Cats that clear infectious virus from the plasma will be negative by virus isolation, ELISA, immunochromatography, and IFA, but will remain positive by provirus PCR (Gomes-Keller et al., 2006a; EBM grade I; Hofmann-Lehmann et al., 2001; Hofmann-Lehmann et al., 2008; Helfer-Hungerbuehler et al., 2015). These cats should be considered regressively infected. The clinical relevance of regressive infection has not been fully established; in some instances, immune suppression or infection with other viruses may lead to reactivation. The mean proviral load in cats with regressive infection is several hundred times lower than in cats with progressive infection once the infection has fully established several weeks after infection. A small proportion (2-3 %) of cats remains positive by ELISA and immunochromatography although no infectious virus can be isolated from plasma. These cats have foci of infection outside the bone marrow from which soluble p27 is released into the circulation; such cats are potential sources of infection (Lutz et al., 1980c). Progressively FeLV-infected cats should be strictly confined indoors, to prevent spread to other cats in the neighbourhood. There may also be benefits in preventing exposure of the immune-suppressed retrovirus-infected cat to infectious agents carried by other animals. This is true for the home environment as well as for the veterinary hospital. Although they can be housed in the same ward as other hospitalised patients, they should be kept in individual cages. Since they may be immune-suppressed, they should be kept separated from cats with other infectious diseases. They should not be placed in a “contagious ward” with cats suffering from e.g. viral respiratory disease. Management should be aimed at minimising potential exposure to other infectious agents. In addition to confining the cat indoors it may be prudent to avoid feeding uncooked meat, which may pose a risk of bacterial or parasitic infections to which progressively infected cats are more susceptible. Asymptomatic FeLV-infected cats should receive clinical check-ups at least every six months. A complete blood count (CBC), biochemistry profiles and urinalyses should be performed periodically, ideally every six to twelve months. Intact male and female FeLV-infected cats should be neutered to minimise the risk of virus transmission and for health benefits. Surgery is generally well tolerated by asymptomatic FeLV-infected cats. The virus is infectious only for a short while outside the host (Francis et al., 1979b), and is sensitive to all disinfectants including common soap; simple precautions and routine cleaning procedures will prevent transmission in the hospital. Routine vaccination in asymptomatic FeLV-infected cats is a matter of discussion (see ABCD guidelines “Vaccination in immunosuppressed cats”). Vaccination programmes to prevent common infectious diseases should be maintained in such cats, although they may not mount an adequate immune response to, e.g. rabies vaccination (Franchini, 1990). In that study, it was found that progressively FeLV-infected cats developed only 10 % of the antibody response of cats not infected by FeLV. Therefore, protection of a progressively FeLV-infected cat may not be as good as that of an uninfected animal. If these cats are allowed outside – which is not recommended — more frequent vaccination may be considered. Inactivated vaccines are recommended whenever available, because it cannot be excluded that modified live virus vaccines may be able to cause symptoms in immune-suppressed cats. Vaccination of progressively FeLV-infected cats against FeLV is of no benefit (Helfer-Hungerbuehler et al., 2015). Neither the p27 levels nor the number of proviral DNA and viral RNA copies decreased. If FeLV-infected cats are sick, prompt and accurate diagnosis of associated or secondary conditions is important to allow early therapeutic intervention and successful treatment. Therefore, more intensive testing should be implemented earlier in the course of illness than in uninfected cats. Many cats with FeLV infection respond well to appropriate medications although a longer or more aggressive course of therapy (e.g., antibiotics) may be needed than in retrovirus-negative cats. Corticosteroids, other immune-suppressive or bone marrow-suppressive drugs should generally be avoided, unless used as a treatment of FeLV-associated malignancies or immune-mediated disease. If chronic gingivostomatitis is present, glucocorticoids should not be used, with except in extreme circumstances. In cats with gingivostomatitis, full mouth extraction is preferred over the use of glucocorticoids. Many complications of FeLV infection respond well to treatment, such as secondary bacterial infections, especially with Mycoplasma haemofelis, which often improves with antibiotic treatment, e.g., doxycycline. Treatment regimes for lymphomas, particularly based on chemotherapeutic drugs, are well established, and the same protocols should be applied to cats with lymphoma that are FeLV-infected. The results of studies on FeLV as a negative prognostic factor with regard to remission and survival times in lymphoma patients are contradictory (Mooney et al., 1987; Vail et al., 1998; Teske et al., 2002; Brenn et al., 2008). In a recent study, FeLV antigen-negative cats with lymphoma had significantly longer remission times (472 days) than FeLV antigen-positive cats (25 days) when both groups received anti-tumour chemotherapy (Meichner et al., 2012). In another study, the median remission and survival times for FeLV antigen-positive cats were 27 and 37 days and for FeLV antigen-negative cats, 146 and 170 days (Vail et al., 1998). The prognosis of lymphoma in cats with progressive FeLV infection is poor because of bone marrow suppression, which is usually exacerbated by chemotherapy and can frequently delay treatment. Immunosuppression caused by FeLV infection also is aggravated by chemotherapy, leading to secondary infection that may cause overt clinical signs and impair quality of life. Furthermore, FeLV-associated lymphomas are associated with a higher rate of mitoses (Valli et al., 2000), possibly indicating a more aggressive biological behaviour that negatively affects outcome. The prognosis is also guarded because of the theoretical risk of development of additional lymphoid malignancies in cats with FeLV-associated lymphoma. During virus replication, FeLV is integrated into the host genome and recombination with endogenous FeLV-related sequences could form new and more pathogenic variants, such as FeLV subtype B, with the potential of new lymphoma formation at any time. Finally, owners of cats with progressive FeLV infection and lymphoma often elect euthanasia and do not comply with treatment. There is little evidence from controlled studies to support the efficacy of immune modulators on the health or longevity of FeLV-infected cats. Nevertheless, it has been suggested that some of these agents may benefit infected animals by restoring compromised immune function, thereby allowing the patient to control its viral burden and recover. Although uncontrolled studies have suggested dramatic clinical improvement (e.g., when using preparations known as “paramunity inducers”), these effects were not observed in carefully controlled studies (Hartmann et al., 1998; EBM grade I). Staphylococcus Protein A is a bacterial polypeptide purified from cell walls of Staphylococcus aureus Cowan I that acts as an immune modulator. In a placebo-controlled study, treatment of ill, client-owned FeLV-infected cats (with 10 g/kg, twice per week for up to ten weeks) did not cause a statistically significant difference in FeLV status. However, in the owners’ impression, the health of their pets had improved (McCaw et al., 2001). The efficacy of antiviral drugs is limited, and many cause severe side effects (Hartmann, 2006). Only a few controlled studies have demonstrated some effect of a few drugs in FeLV infected cats (see tables 1, 2 and 3). EBM grade I = This is the best evidence, comprising data obtained from properly designed, randomised controlled clinical trials in the target species (in this context cats). EBM grade II = Data obtained from properly designed, randomised controlled studies in the target species with spontaneous disease in an experimental setting. EBM grade III = Data based on non-randomised clinical trials, multiple case series, other experimental studies, and dramatic results from uncontrolled studies. EBM grade IV = Expert opinion, case reports, studies in other species, pathophysiological justification. Feline interferon-ω inhibits FeLV replication in vitro. Treatment of FeLV-viraemic cats significantly improved their health and extended their survival time, but it did not resolve viraemia (De Mari et al., 2004; EBM grade I). In a placebo-controlled field study, 48 FeLV-infected cats were treated with interferon-ω (106 IU/kg s.c. q24h on five consecutive days repeated three times with several weeks between treatments), a statistically significant difference was found in the survival time of treated versus untreated cats after nine months, but not after one year (De Mari et al., 2004; EBM grade I). No viral parameters, however, were measured to support the assumption that interferon exerted an anti-FeLV effect rather than inhibited secondary infections. An antiviral compound routinely used is zidovudine [3’-azido-2’,3’-dideoxythymidine (AZT)], a nucleoside analogue (thymidine derivative) that blocks retroviral reverse transcriptase. The drug effectively inhibits FeLV replication in vitro, and in vivo in experimental infections. It can reduce plasma virus load, improve the immunological and clinical status, increase the quality of life, and prolong life expectancy in FeLV-infected cats. It can be used at a dosage of 5 -10 mg/kg q12h per os or s.c.. Higher doses should be used carefully, as side effects (e.g. non-regenerative anaemia) can develop (Hartmann, 2005; EBM grade I). The HIV integrase inhibitor Raltegravir was found to significantly inhibit FeLV in vitro (Cattori et al., 2011). The drug is tolerated very well by cats and within one week leads to a marked reduction in viral loads. However, this reduction is not sufficient for the immune system to control the viraemia, and treatment has to be continued over long periods in order to maintain low viral loads and prevent disease (Boesch et al., 2015; EBM grade III). After several experimental vaccines had been described (Jarrett et al., 1974, 1975; Pedersen et al., 1979), the first FeLV vaccine used in veterinary practice was introduced in the USA in 1984. It was based on conventionally prepared FeLV antigens, and it protected cats from viraemia (Lewis et al., 1981). A number of FeLV vaccines are now available in Europe. Some used recombinant DNA technology, like the one consisting of the viral envelope glycoprotein as well as part of the transmembrane protein expressed in E. coli (Kensil et al., 1991); this was the first genetically engineered small animal vaccine (Lehmann et al., 1991). Another recombinant vaccine uses a canarypox virus vector that carries the genes for the envelope glycoprotein and the capsid protein (Tartaglia et al., 1993). After injection, there is a single round of replication by the vector poxvirus resulting in the expression of the inserted FeLV genes. In contrast to other cat vaccines, neutralising antibodies do not develop. The protective effect is presumably achieved by stimulating cellular immunity; neutralising antibodies develop only if vaccinated cats encounter field virus (Hofmann-Lehmann et al., 2006). The differences between available FeLV vaccines are more significant than those for other feline infectious diseases with differences in performance, particularly efficacy of protection but also with regards to adverse effects. Comparison of efficacy studies can be misleading because of differences in the protocols – such as the cat breed, route of challenge, challenge strain used and the criteria for defining protection (Sparkes, 2003; Torres et al., 2010). Different studies of the same vaccine sometimes led to divergent results. The first published cell-culture-based FeLV vaccine and some others, which have not come to or are no longer on the market, have performed poorly, as found in independent efficacy studies with disappointing protection. The European Pharmacopoeia defines the criteria for assessing the efficacy of protection. A common problem is the difficulty to infect healthy control cats with a single experimental challenge. The criteria include a minimum acceptable infectivity rate in controls to confirm that an acceptably strong challenge has been provided. Natural resistance to FeLV challenge is taken into account when calculating the level of protection, which is then expressed as the “preventable fraction” (Scarlett and Pollock, 1991). Some protocols have been based on a “natural” FeLV challenge – by co-mingling progressively infected with naïve cats. These protocols are not in agreement with the European Pharmacopoeia, but they mimic the natural mode of virus transmission, which is generally based not on a single large exposure but on chronic exposure over a period of time. Cohabiting progressively infected cats with vaccinated naïve cats is regarded by clinical experts as a more realistic measure of protection that vaccines would provide in the field. In many experiments it was shown that no FeLV vaccine provides complete (100 % efficacy) protection, nor does it prevent infection. Vaccinated and subsequently virus-exposed cats become provirus- and viral RNA positive in the blood, although at very low levels when compared with cats with progressive infection (Hofmann-Lehmann et al., 2007; EBM grade III). These experiments confirm that FeLV vaccination neither induces sterilising immunity nor does it protect from infection, when cats are exposed to field virus. However, most vaccinated cats are protected from progressive infection and development of FeLV associated disease. Only one study found absence of p27, viral RNA and DNA in most cats vaccinated with one out of two whole inactivated virus vaccines after intraperitoneal virus challenge (Torres et al., 2010). FeLV vaccines should generally be included in the routine vaccination programme for pet cats that have access to outdoors. Protection against a potentially life-threatening infection is justified in these cats, and the benefit for considerably outweighs any risk of adverse effects. In situations where the probability of exposure to FeLV can be discounted, vaccination is not recommended. Geographical variations of the prevalence of FeLV may influence the decision. In some European countries FeLV has been almost eliminated, but there may be local variations in the prevalence within countries. The lifestyle of individual cats is also a decision factor; if it can be assured that a cat will not be exposed to FeLV, vaccination is unnecessary. However, owners’ circumstances may change, and with them their cats’ lifestyle, particularly when moving house. This possibility should be considered especially in kittens presented for primary vaccination. sarcomas (FISS) (see also ABCD FISS guidelines) (Hendrick et al., 1992; Kass et al., 1993; Hendrick et al., 1994; Macy, 1995; Kass et al., 2003; Dean et al., 2006; Hartmann et al., 2015). In contrast to fibrosarcomas caused by FeSV, FISS have different histological characteristics (Doddy et al., 1996; Madewell et al., 2001) and behave aggressive (Hendrick et al., 1994) with rate of metastasis, mainly to the lung, ranges from 10 to 28 % (Sandler et al., 1997; Couto and Macy, 1998; Hershey et al., 2000; Kobayashi et al., 2002). FISS are difficult to treat, and require aggressive surgery, optimally combined with radiation therapy, chemotherapy, and additional immunotherapy (Hirschberger and Kessler, 2001; Jahnke et al., 2007; Huttinger et al., 2008; Jas et al., 2015). The most widely accepted hypothesis of FISS pathogenesis suggests that a chronic inflammatory reaction at the site of an injection acts as a trigger for subsequent malignant transformation. Adjuvanted vaccines have been linked to the development of local inflammation. With respect to FISS development, FeLV vaccines should be used that cause the least subcutaneous inflammatory reaction, thus, non-adjuvanted, modified-live or recombinant vaccines should be preferred over adjuvanted vaccines, if such vaccines are available and have been proven to be equally effective (Hartmann et al., 2018). Vaccination should be carried out in all cats at risk of exposure. It is recommended that kittens be vaccinated at the age of 8 or 9 weeks and 12 weeks, together with the core vaccinations (Brunner et al., 2006). The primary vaccination course includes an additional vaccine dose given one year later. Combination of different immunogens in one syringe is only legal when the company has registered it for that country, therefore the local veterinary regulations should be carefully consulted. If its FeLV status is unknown, the cat should be tested for FeLV infection by ELISA or immunochromatography, preferably also by DNA PCR for FeLV provirus prior to vaccination in order to avoid overvaccination. If FeLV infection prior to vaccination is unlikely, testing may not be needed (e.g. kittens from an FeLV antigen-negative queen and tomcat, which had no contact with other cats). New data show that annual booster vaccinations after a full primary vaccination course might not be necessary. In one study it was shown that an adjuvanted inactivated whole virus FeLV vaccine provided immunity for at least 2 years (Jirjis et al., 2010; EBM grade II). Recently, a commercial vaccine has arrived on the market with a claim of a 3 year duration of immunity. A study with this adjuvanted, inactivated whole virus vaccine exposing cats eight, 20, and 36 months after vaccination to FeLV was hampered by the age-related resistance of the cats to the FeLV challenge. The control cats did not show the required level of progressive infection (Wilson et al., 2012). 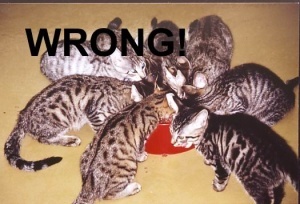 Nonetheless, only one of 44 vaccinated cats became progressively infected. Combined with the lower susceptibility of adult cats to FeLV infection, the ABCD recommends that, in cats older than three years, a booster immunisation every two to three years is sufficient. If a cat is diagnosed with progressive FeLV infection in a multi-cat household, all of the cats should be tested. If indeed more progressively infected cats are identified, a test and removal system should be implemented, which involves periodic testing and removal of the antigen-positive cats until all test negative. The best method of preventing spread of infection is to isolate the progressively infected individuals (as well as regressively infected cats during their initial phase in case of being transiently antigen-positive) and to prevent interaction with uninfected housemates. Although protection conferred by FeLV vaccines is good in most situations, the ABCD does not recommend reliance solely on vaccination to protect negative cats living together with progressively FeLV-infected cats. There are marked geographical differences in the prevalence of FeLV in rescued cats in Europe, which may influence policies of testing and vaccination. In some countries, like the UK and The Netherlands, the prevalence is low, whilst in others it is noticeably higher, with regional differences within these countries. Wherever possible, particularly in terms of the risk of FeLV and/or FIV infection, cats entering a shelter should ideally be kept in quarantine for at least 6 weeks, if not (re)homed sooner. All incoming cats (at least in situations with a risk for FeLV and in shelters that allow contact between cats after the quarantine period) should be screened for FeLV antigen and FIV antibody, ideally also for FeLV provirus. Antigen-negative but provirus-positive results suggest that the cat is not progressively, but regressively infected. If only an FeLV antigen test is performed, cats testing negative should ideally be retested 6 weeks later and kept in quarantine for this time period (Möstl et al., 2013), as it may take 4-6 weeks after infection until the test turns positive. After quarantine, FeLV antigen-negative cats can be introduced into small groups of healthy cats. Progressively FeLV-infected cats have to be kept separate, ideally housed individually, but may be housed together with other progressively infected cats. Progressively infected healthy cats should be adopted out to adequate homes as soon as possible. It must be ensured that such cats cannot pose any risk of infection to other cats. This may require positive cats to be re-homed to households where they will live in isolation indoors or only with other FeLV-infected cats. Ideally, also regressively infected cats (antigen-negative, but provirus-positive) should be placed in a separate place, not together with FeLV-naïve cats, because regressive infection may be reactivated under stressful situations. The ABCD does not recommend euthanasia of healthy progressively FeLV-infected cats. However, if no adequate home can be found and if separation from the rest of the population is impossible, or if the cat is sick, euthanasia should be considered. Detailed recommendations are provided in the ABCD guidelines “Prevention of infectious diseases in cat shelters” (Möstl et al., 2013). The prevalence of FeLV infection is now very low in pedigree breeding catteries in most European countries, largely as a result of routine testing and the removal of infected cats. It is recommended that routine testing is continued once or twice a year in such catteries. Contact should be limited to cats from establishments that implement a similar routine. If any cats are allowed access outside, with the opportunity of contact with neighbouring cats of uncertain FeLV status (discouraged for pedigree breeding cats), they should be vaccinated. Anderson MM, Lauring AS, Burns CC, Overbaugh J (2000): Identification of a cellular cofactor required for infection by feline leukemia virus. Science 287(5459), 1828-1830. Bachman D, Cockerell GL, de Noronha F, Rapp J (1982): Effect of bacille Calmette-Guerin immunotherapy on feline sarcoma virus-induced neoplasms in the cat. Am J Vet Res 43, 475-480. Barbacid M, Stephenson JR, Aaronson SA (1977): Evolutionary relationships between gag gene-coded proteins of murine and primate endogenous type C RNA viruses. Cell 10, 641-648. Besmer P (1983): Acute transforming feline retroviruses. In Vogt P, Koprowski H (eds): Contemp Top Microbiol Immunol 107, 1. Boenzli E, Hadorn M, Hartnack S, Huder J, Hofmann-Lehmann R, Lutz H (2014): Detection of antibodies to the feline leukemia virus (FeLV) transmembrane protein p15E: an alternative approach for serological FeLV detection based on antibodies to p15E. J Clin Microbiol 52, 2046-2052. Boesch A, Cattori V, Riond B, Willi B, Meli ML, Rentsch KM, Hosie MJ, Hofmann-Lehmann R, Lutz H (2015): Evaluation of the effect of short-term treatment with the integrase inhibitor raltegravir (IsentressTM) on the course of progressive feline leukemia virus infection. Vet Microbiol 175, 167-178. Boretti FS, Ossent P, Bauer-Pham K, Weibel B, Meili T, Cattori V, Wolfensberger C, Reinacher M, Lutz H, Hofmann-Lehmann R (2004): Recurrence of feline leukemia virus (FeLV) and development of fatal lymphoma concurrent with feline immunodeficiency virus (FIV) induced immune suppression. Presented at the 7th International Feline Retrovirus Research Symposium, Pisa, Italy. Brenn SH, Couto, SS, Craft, DM, Leung C, Bergman PJ (2008): Evaluation of P-glycoprotein expression in feline lymphoma and correlation with clinical outcome. Vet Comp Oncol 6, 201-211. Brunner C, Kanellos T, Meli ML, Sutton DJ, Gisler R, Gomes-Keller MA, Hofmann-Lehmann R, Lutz H (2006): Antibody induction after combined application of an adjuvanted recombinant FeLV vaccine and a multivalent modified live virus vaccine with a chlamydial component. Vaccine 24, 1838-1846. Cattori V, Pepin AC, Tandon R, et al (2008): Real-time PCR investigation of feline leukemia virus proviral and viral RNA loads in leukocyte subsets. Vet Immunol Immunpathol 123, 124-128. Cattori V, Tandon R, Riond B, Pepin AC, Lutz H, Hofmann-Lehmann R (2009): The kinetics of feline leukaemia virus shedding in experimentally infected cats are associated with infection outcome. Vet Microbiol 133, 292-296. Cattori V, Weibel B, Lutz H (2011): Inhibition of Feline leukemia virus replication by the integrase inhibitor Raltegravir. Vet Microbiol 152, 165-168. Coffin JM (1979): Structure, replication, and recombination of retrovirus genomes: some unifying hypotheses. J Gen Virol 42, 1-26. Cong W, Meng QF, Blaga R, Villena I, Zhu XQ, Qian AD (2016): Toxoplasma gondii, Dirofilaria immitis, feline immunodeficiency virus (FIV), and feline leukemia virus (FeLV) infections in stray and pet cats (Felis catus) in northwest China: co-infections and risk factors. Parasitol Res 115, 217-223. 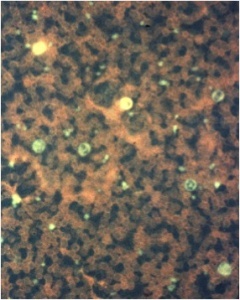 Cotter SM (1979): Anaemia associated with feline leukemia virus infection. J Am Vet Med Assoc 175, 1191-1194. Couto CG, Macy DW (1998): Review of treatment options for vaccine-associated feline sarcoma. J Am Vet Med Assoc 213, 1426-1427. Cunningham MW, Brown MA, Shindle DB, Terrell SP, Hayes KA, Ferree BC, McBride RT, Blankenship EL, Jansen D, Citino SB, et al (2008): Epizootiology and management of feline leukemia virus in the Florida puma. J Wildl Dis 44, 537-552. Dean R, Adams V, Whitebread T, et al (2006): Study of feline injection site sarcomas. Vet Rec 159, 641-642. De Mari K, Maynard L, Sanquer A, Lebreux B, Eun HM (2004): Therapeutic effects of recombinant feline interferon-omega on feline leukemia virus (FeLV)-infected and FeLV/feline immunodeficiency virus (FIV)-coinfected symptomatic cats. J Vet Intern Med 18, 477-482. Doddy FD, Glickman LT, Glickman NW, et al (1996): Feline fibrosarcomas at vaccination sites and non-vaccination sites. J Comp Pathol 114, 165-174. Donner L, Fedele LA, Garon CF, Anderson SJ, Sherr CJ (1982): McDonough Feline sarcoma virus: characterization of the molecularly cloned provirus and its feline oncogene (vfms). J Virol 41, 489-500. 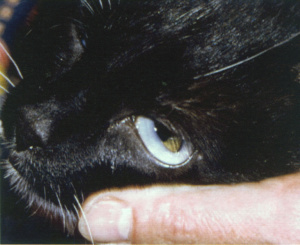 Dow SW, Hoover EA (1992): Neurologic disease associated with feline retroviral infection. P1010. In Kirk RW, Bonagura JD (eds): Current Veterinary Therapy Vol XI, WB Saunders, Philadelphia. Ellis JA, Jackson ML, Bartsch RC, McGill LG, Martin KM, Trask BR, et al (1996): Use of immunohistochemistry and polymerase chain reaction for detection of oncornaviruses in formalin-fixed, paraffin-embedded fibrosarcomas from cats. J Am Vet Med Assoc 209, 767-771. Englert T, Lutz H, Sauter-Louis C, Hartmann K (2012): Survey of the feline leukemia virus infection status of cats in Southern Germany. J Feline Med Surg 14, 392-398. Filoni C, Catão-Dias JL, Cattori V, Willi B, Meli ML, Corrêa SH, Marques MC, Adania CH, Silva JC, Marvulo MF, Ferreira Neto JS, Durigon EL, de Carvalho VM, Coutinho SD, Lutz H, Hofmann-Lehmann R (2012): Surveillance using serological and molecular methods for the detection of infectious agents in captive Brazilian neotropic and exotic felids. J Vet Diagn Invest 24, 166-173. Floyd K, Suter PF, Lutz H (1983): Granules of blood eosinophils are stained directly by anti-immunoglobulin fluorescein isothiocyanate conjugates. Am J Vet Res 44, 2060-2063. Flynn JN, Dunham SP, Watson V, Jarrett O (2002): Longitudinal analysis of feline leukemia virus-specific cytotoxic T lymphocytes: correlation with recovery from infection. J Virol 76, 2306-2315. Fontenot JD, Hoover EA, Elder JH, et al (1992): Evaluation of feline immunodeficiency virus and feline leukemia virus transmembrane peptides for serological diagnosis. J Clin Microbiol 30, 1885-1890. Franchini M (1990): Die Tollwutimpfung von mit felinem Leukämievirus infizierten Katzen. Vet.Diss. Zürich Univ. Francis DP, Cotter SM, Hardy WD, Jr., Essex M (1979a): Comparison of virus-positive and virus-negative cases of feline leukemia and lymphoma. Cancer Research 39, 3866-3870. Francis DP, Essex M, Gayzagian D (1979b): Feline leukemia virus: survival under home and laboratory conditions. J Clin Microbiol 9, 154-156.
reduction of concurrent viral excretion in retrovirus infected cats from a rescue shelter. Res Vet Sci 94, 753–763. Gomes-Keller MA, Gonczi E, Tandon R, et al (2006a): Detection of feline leukemia virus RNA in saliva from naturally infected cats and correlation of PCR results with those of current diagnostic methods. J Clin Microbiol 44, 916-922. 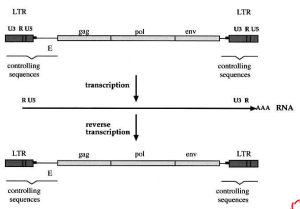 Gomes-Keller MA, Tandon R, Gonczi E, Meli ML, Hofmann-Lehmann R, Lutz H (2006b): Shedding of feline leukemia virus RNA in saliva is a consistent feature in viraemic cats. Vet Microbiol 112, 11-21. Grant CK, Essex M, Gardner MB, Hardy WD, Jr (1980): Natural feline leukemia virus infection and the immune response of cats of different ages. Cancer Research 40, 823-829. Greene CE and Watson AdJ (1998): Antiviral drugs. in: Greene CE (ed). infectious diseases of the dog and cat. 2nd ed. St Louis, Mo: Elsevier Saunders, 6–9. Greggs WM, 3rd, Clouser CL, Patterson SE, et al (2012): Discovery of drugs that possess activity against feline leukemia virus. J Gen Virol 93, 900–905. Haffer KN, Sharpee RL, Beckenhauer W, Koertje WD, Fanton RW (1987): Is the feline leukaemia virus responsible for neurologic abnormalities in cats? Vet Med 82, 802. Hardy WD Jr (1981): The feline leukemia viruses. J Am Anim Hosp Assoc 17, 951-980. Hardy WD Jr, Geering G, Old LJ, de Harven E, Brodey RS, McDonough SK (1970): Serological studies of the feline leukemia virus. Bibl Haematol 36, 343-354. Hardy WD Jr, Hess PW, MacEwen EG, McClelland AJ, Zuckerman EE, Essex M, Cotter SM, Jarrett O (1976): Biology of feline leukemia virus in the natural environment. Cancer Res 36(2 pt 2), 582-588. Hardy WD Jr, Hirshaut Y, Hess P (1973): Detection of the feline leukemia virus and other mammalian oncornaviruses by immunofluorescence. Bibl Haematol 39, 778-799. Hartmann K (2005): FeLV treatment strategies and prognosis. Suppl Compend Contin Educ Pract Vet 27, 14-26. Hartmann K (2006): Antiviral and immunomodulatory chemotherapy. In: Greene CE (Ed). Infectious Diseases of the Dog and Cat. 3rd edition. Elsevier Saunders, St. Louis, USA, 10-25. Hartmann K (2012): Antiviral and immunomodulatory chemotherapy. In: Greene CE (ed). Infectious diseases of the dog and cat. 4th ed. St Louis, MO: Elsevier Saunders, 2012, 10–24. Hartmann K, Block A, Ferk G, Vollmar A, Goldberg M, Lutz H (1998): Treatment of feline leukemia virus-infected cats with paramunity inducer. Vet Immunol Immunopathol 65, 267-275. Hartmann K, Block A, Ferk G, Beer B, Vollmar A, Lutz H (1999): Treatment of feline leukemia virus (FeLV) infection. Vet Microbiol 69, 111-113. Hartmann K, Day MJ, Thiry E, et al (2018): Feline injection-site sarcoma. ABCD guidelines on prevention and management. http://www.abcdcatsvets.org/feline-injection-site-sarcoma-2/. Hartmann K, Donath A, Beer B, et al (1992): Use of two virustatica (AZT, PMEA) in the treatment of FIV and of FeLV seropositive cats with clinical symptoms. Vet Immunol Immunopathol 35, 167–175. Hartmann K, Griessmayr P, Schulz B, Greene CE, Vidyashankar AN, Jarrett O, Egberink HF (2007): Quality of different in-clinic test systems for feline immunodeficiency virus and feline leukaemia virus infection. J Feline Med Surg 9, 439-445. Hartmann K, Werner RM, Egberink H, Jarrett O (2001): Comparison of six in-house tests for the rapid diagnosis of feline immunodeficiency and feline leukaemia virus infections. Vet Rec 149, 317-320. Hawks DM, Legendre AM, Rohrbach BW (1991): Comparison of four test kits for feline leukemia virus antigen. J Am Vet Med Assoc 199, 1373-1377. Helfer-Hungerbuehler AK, Widmer S, Kessler Y, Riond B, Boretti FS, Grest P, Lutz H, Hofmann-Lehmann R (2015): Long-term follow up of feline leukemia virus infection and characterization of viral RNA loads using molecular methods in tissues of cats with different infection outcomes. Virus Res 197, 137-150. Hendrick MJ, Goldschmidt MH, Shofer FS, et al (1992): Postvaccinal sarcomas in the cat: epidemiology and electron probe microanalytical identification of aluminium. Cancer Res 52, 5391-5394. Hendrick MJ, Shofer FS, Goldschmidt MH, et al (1994): Comparison of fibrosarcomas that developed at vaccination sites and at non-vaccination sites in cats: 239 cases (1991-1992). J Am Vet Med Assoc 205, 1425-1429. Hershey AE, Sorenmo KU, Hendrick MJ, et al (2000): Prognosis for presumed feline vaccine-associated sarcoma after excision: 61 cases (1986-1996). J Am Med Vet Assoc 216, 58-61. Hirschberger J, Kessler M (2001): Das feline Fibrosarkom. Tierärztliche Praxis 29, 66-71. Hofmann-Lehmann R, Cattori V, Tandon R, Boretti FS, Meli ML, Riond B, Lutz H (2008): How molecular methods change our views of FeLV infection and vaccination. Vet Immunol Immunpathol 123, 119-123. Hofmann-Lehmann R, Cattori V, Tandon R, Boretti FS, Meli ML, Riond B, Pepin AC, Willi B, Ossent P, Lutz H (2007): Vaccination against the feline leukaemia virus: Outcome and response categories and long-term follow-up. Vaccine 25, 5531-5539. Hofmann-Lehmann R, Holznagel E, Aubert A, Ossent P, Reinacher M, Lutz H (1995): Recombinant FeLV vaccine: long-term protection and effect on course and outcome of FIV infection. Vet Immunol Immunopathol 46, 127-137. Hofmann-Lehmann R, Huder JB, Gruber S, Boretti F, Sigrist B, Lutz H (2001): Feline leukaemia provirus load during the course of experimental infection and in naturally infected cats. J Gen Virol 82 (Pt 7), 1589-1596. Hofmann-Lehmann R, Tandon R, Boretti FS, Meli ML, Willi B, Cattori V, Gomes-Keller MA, Ossent P, Golder MC, Flynn JN et al (2006): Reassessment of feline leukaemia virus (FeLV) vaccines with novel sensitive molecular assays. Vaccine 24, 1087-1094. Hoover EA, Ebner JP, Zeidner NS, et al (1991): Early therapy of feline leukemia virus infection (FeLVFAIDS) with 9-(2-phosphonylmethoxyethyl)adenine (PMEA). Antiviral Res 16, 77–92. Hoover EA, Olsen RG, Hardy WD Jr, Schaller JP, Mathes LE (1976): Feline leukemia virus infection: age-related variation in response of cats to experimental infection. J Natl Cancer Inst 57, 365-369. Hoover EA, Schaller JP, Mathes LE, Olsen RG (1977): Passive immunity to feline leukemia: evaluation of immunity from dams naturally infected and experimentally vaccinated. Infect Immun 16, 54-59. Hoover EA, Zeidner NS and Mullins Ji. (1990): Therapy of presymptomatic FeLV-induced immunodeficiency syndrome with AZT in combination with alpha interferon. Ann N Y Acad Sci 616, 258–269. Hoover EA, Zeidner NS, Perigo NA, et al (1989): Feline leukemia virus-induced immunodeficiency syndrome in cats as a model for evaluation of antiretroviral therapy. Intervirology 30 Suppl 1, 12–25. Hosie MJ, Robertson C, Jarrett O (1989): Prevalence of feline leukaemia virus and antibodies to feline immunodeficiency virus in cats in the United Kingdom. Vet Rec 125, 293. Huttinger C, Hirschberger J, Jahnke A, et al (2008): Neoadjuvant gene delivery of feline granulocyte-macrophage colony-stimulating factor using magnetofection for the treatment of feline fibrosarcomas: a phase I trial. J Gene Med 10, 655-667. Jackson ML, Haines DM, Meric SM, Misra V (1993): Feline leukemia virus detection by immunohistochemistry and polymerase chain reaction in formalin-fixed paraffin-embedded tumor tissue from cats with lymphosarcoma. Can J Vet Res 57, 269-276. Jackson ML, Haines DM, Taylor SM, Misra V (1996): Feline leukemia virus detection by ELISA and PCR in peripheral blood from 68 cats with high, moderate, or low suspicion of having FeLV-related disease. J Vet Diagn Invest 8, 25-30. Jahnke A, Hirschberger J, Fischer C, et al (2007): Intra-tumoral gene delivery of feIL-2, feIFN-gamma and feGM-CSF using magnetofection as a neoadjuvant treatment option for feline fibrosarcomas: a phase-I study. J Vet Med A Pysiol Pathol Clin Med 54, 599-606. Jameson P and Essex M (1983): Inhibition of feline leukemia virus replication by human leukocyte interferon. Antiviral Res 3, 115–120. 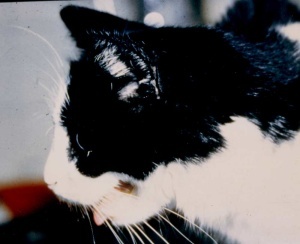 Jarrett O (1980): Feline leukaemia virus diagnosis. Vet Rec 106, 513. Jarrett WF, Crawford EM, Martin WB, Davie F (1964): A Virus-Like Particle Associated with Leukemia (Lymphosarcoma). Nature 202, 567-569. Jarrett O, Golder MC, Weijer K (1982): A comparison of three methods of feline leukaemia virus diagnosis. Vet Rec 110, 325-358. Jarrett W, Jarrett O, Mackey L, Laird H, Hood C, Hay D (1975): Vaccination against feline leukaemia virus using a cell membrane antigen system. Int J Cancer 16, 134-141. Jarrett W, Mackey L, Jarrett O, Laird H, Hood C (1974): Antibody response and virus survival in cats vaccinated against feline leukaemia. Nature 248, 230-232. Jas D, Soyer C, De Fornel-Thibaud P, et al (2015): Adjuvant immunotherapy of feline injection-site sarcomas with the recombinant canarypox virus expressing feline interleukine-2 evaluated in a controlled monocentric clinical trial when used in association with surgery and brachytherapy. Trials Vaccinol 4, 1-8. Jirjis F, Davis T, Lane J, Carritt K, Sweeney D, Williams J, Wasmoen T (2010): Protection against feline leukemia virus challenge for at least 2 years after vaccination with an inactivated feline leukemia virus vaccine. Vet Ther 11, E1-6. Kass PH, Barnes WG, Spangler WL, et al (1993): Epidemiologic evidence for a causal relation between vaccination and fibrosarcoma tumorigenesis in cats. J Am Vet Med Assoc 203, 396-405. Kass PH, Spangler WL, Hendrick MJ, et al (2003): Multicenter case-control study of risk factors associated with development of vaccine-associated sarcomas in cats. J Am Vet Med Assoc 23, 1283-1292. Kensil CR, Barrett C, Kushner N, Beltz G, Storey J, Patel U, Recchia J, Aubert A, Marciani D (1991): Development of a genetically engineered vaccine against feline leukemia virus infection. J Am Vet Med Assoc 199, 1423-1427. Kidney BA, Ellis JA, Haines DM, Jackson ML (2001): Comparison of endogenous feline leukemia virus RNA content in feline vaccine and nonvaccine site-associated sarcomas. Am J Vet Res 62, 1990-1994. Knowles JO, Gaskell RM, Gaskell CJ, Harvey CE, Lutz H (1989): Prevalence of feline calicivirus, feline leukaemia virus and antibodies to FIV in cats with chronic stomatitis. Vet Rec 124, 336-338. Kobayashi T, Hauck ML, Dodge R, et al (2002): Preoperative radio therapy for vaccine associated sarcoma in 92 cats. Vet Radiol Ultrasound 43, 473-479. Kociba GJ (1986): Hematologic consequences of feline leukaemia virus infection. In Kirk RW (Ed): Current Veterinary Therapy. Vol XIII. p448, WB Saunders, Philadelphia. Lehmann R, Franchini M, Aubert A, Wolfensberger C, Cronier J, Lutz H (1991): Vaccination of cats experimentally infected with feline immunodeficiency virus, using a recombinant feline leukemia virus vaccine. J Am Vet Med Assoc 199, 1446-1452. Leutenegger CM, Hofmann-Lehmann R, Riols C, Liberek M, Worel G, Lups P, Fehr D, Hartmann M, Weilenmann P, Lutz H (1999): Viral infections in free-living populations of the European wildcat. J Wildl Dis 35, 678-686. Levy JK, Scott HM, Lachtara JL, Crawford PC (2006): Seroprevalence of feline leukemia virus and feline immunodeficiency virus infection among cats in North America and risk factors for seropositivity. J Am Vet Med Assoc 228, 371-376. Lewis MG, Mathes LE, Olsen RG (1981): Protection against feline leukemia by vaccination with a subunit vaccine. Infect Immun 34, 888-894. Little S (2011): A review of feline leukemia virus and feline immunodeficiency virus seroprevalence in cats in Canada. Vet Immunol Immunopathol 143, 243-245. Lloret A (2009): The process of evidence-based medicine. J Feline Med Surg 11, 529. Louwerens M, London CA, Pedersen NC, Lyons LA (2005): Feline lymphoma in the post-feline leukemia virus era. J Vet Intern Med 19, 329-335. Lutz H, Lehmann R, Winkler G, Kottwitz B, Dittmer A, Wolfensberger C, Arnold P (1990): Feline immunodeficiency virus in Switzerland: clinical aspects and epidemiology in comparison with feline leukemia virus and coronaviruses. Schweiz Arch Tierheilkd 132, 217-225. Lutz H, Pedersen NC, Durbin R, Theilen GH (1983a): Monoclonal antibodies to three epitopic regions of feline leukemia virus p27 and their use in enzyme-linked immunosorbent assay of p27. J Immunol Methods 56, 209-220. Lutz H, Pedersen NC, Harris CW, Higgins J (1980b): Detection of feline leukemia virus infection. Feline Pract 10, 13-23. Lutz H, Pedersen NC, Higgins J, Harris HW, Theilen GH (1980c): Quantitation of p27 in the serum of cats during natural infection with feline leukemia virus. In: Feline Leukemia Virus, Hardy WD, Essex M, McClelland A, (eds); Development in Cancer Res 4 , 497505, Elsevier/North Holland. Lutz H, Pedersen N, Higgins J, Hubscher U, Troy FA, Theilen GH (1980a): Humoral immune reactivity to feline leukemia virus and associated antigens in cats naturally infected with feline leukemia virus. Cancer Research 40, 3642-3651. Lutz H, Pedersen NC, Theilen GH (1983b): Course of feline leukemia virus infection and its detection by enzyme-linked immunosorbent assay and monoclonal antibodies. Am J Vet Res 44, 2054-2059. Macy DW (1995): The potential role and mechanisms of FeLV vaccine-induced neoplasms. Semin Vet Med Surg (Small Anim) 10, 234-237. Madewell BR, Griffey SM, McEntee MC, et al (2001): Feline vaccine-associated fibrosarcoma: an ultrastructural study of 20 tumors (1996-1999). Vet Pathol 38, 196-202. Major A, Cattori V, Boenzli E, Riond B, Ossent P, Meli ML, Hofmann-Lehmann R, Lutz H (2010): Exposure of cats to low doses of FeLV: seroconversion as the sole parameter of infection. Vet Res 41, 17. Mathes LE, Polas PJ, Hayes KA, et al (1992): Pre- and post - exposure chemoprophylaxis: evidence that 3'-azido- 3'-dideoxythymidine inhibits feline leukemia virus disease by a drug-induced vaccine response. Antimicrob Agents Chemother 36, 2715–2721. McCaw DL, Boon GD, Jergens AE, Kern MR, Bowles MH, Johnson JC (2001): Immunomodulation therapy for feline leukemia virus infection. J Am Anim Hosp Assoc 37, 356-363. Meichner K, Kruse DB, Hirschberger J, Hartmann K (2012): Changes in prevalence of progressive feline leukaemia virus infection in cats with lymphoma in Germany. Vet Rec 171, 348. Meli ML, Cattori V, Martinez F, Lopez G, Vargas A, Simon MA, Zorrilla I, Munoz A, Palomares F, Lopez-Bao JV, et al (2009): Feline leukemia virus and other pathogens as important threats to the survival of the critically endangered Iberian lynx (Lynx pardinus). PLoS One 4, e4744. Miyazawa T, Yoshikawa R, Golder M, Okada M, Stewart H, Palmarini M. (2010): Isolation of an infectious endogenous retrovirus in a proportion of live attenuated vaccines for pets. J Virol 84: 3690-3694. doi: 10.1128/JVI.02715-09. Epub 2010 Jan 27. Möstl K, Egberink H, Addie D, Frymus T, Boucraut-Baralon C, Truyen U, et al (2013): Prevention of infectious diseases in cat shelters. ABCD guidelines. J Feline Med Surg 15, 546-554. Mooney SC, Hayes AA, Matus RE, MacEwen EG (1987): Renal lymphoma in cats: 28 cases (1977-1984). J Am Vet Med Assoc 191, 1473-1477. Moore FM, Emerson WE, Cotter SM, DeLellis RA (1986): Distinctive peripheral lymph node hyperplasia of young cats. Vet Pathol 23, 386. Mora M, Napolitano C, Ortega R, Poulin E, Pizarro-Lucero J (2015): Feline Immunodeficiency Virus and Feline Leukemia Virus Infection in Free-Ranging Guignas (Leopardus Guigna) and Sympatric Domestic Cats in Human Perturbed Landscapes on Chiloe Island, Chile. J Wildl Dis 51, 199-208. Mukherji E, Au JL and Mathes LE (1994): Differential antiviral activities and intracellular metabolism of 3'-azido-3'-deoxythymidine and 2',3'-dideoxy - inosine in human cells. Antimicrob Agents Chemother 38, 1573–1579. Nelson P, Sellon R, Novotney C et al (1995): Therapeutic effects of diethylcarbamazine and 3’-azido-3’-deoxythymidine on feline leukemia virus lymphoma formation. Vet Immunol Immunopathol 46, 181-194. Nesina S, Helfer-Hungerbuehler AK, Riond B, Boretti FS, Willi B, Meli ML, Grest P, Hofmann-Lehmann R (2015): Retroviral DNA--the silent winner: blood transfusion containing latent feline leukemia provirus causes infection and disease in naive recipient cats. Retrovirology 12, 105. Ogilvie GK, Sundberg JP, O’Banion MK, Badertscher RR 2nd, Wheaton LG, Reichmann ME (1988): Clinical and immunologic aspects of FeLV-induced immunosuppression. Vet Microbiol 17, 287-296. Orosz CG, Zinn NE, Olsen RG, Mathes LE (1985a): Retrovirus-mediated immunosuppression. I. FeLV-UV and specific FeLV proteins alter T lymphocyte behavior by inducing hyporesponsiveness to lymphokines. J Immunol 134, 3396-3403. Orosz CG, Zinn NE, Olsen RG, Mathes LE (1985b): Retrovirus-mediated immunosuppression. II. FeLV-UV alters in vitro murine T lymphocyte behavior by reversibly impairing lymphokine secretion. J Immunol 135, 583-590. Pacitti AM, Jarrett O, Hay D (1986): Transmission of feline leukaemia virus in the milk of a non-viraemic cat. Vet Rec 118, 381-384. Pedersen NC, Theilen GH, Werner LL (1979): Safety and efficacy studies of live-and killed-feline leukemia virus vaccines. Am J Vet Res 40, 1120. Perryman LE, Hoover EA, Yohn DS (1972): Immunologic reactivity of the cat: immunosuppression in experimental feline leukemia. J Natl Cancer Inst 49, 1357-1365. Pinches MD, Diesel G, Helps CR, Tasker S, Egan K, Gruffydd-Jones TJ (2007): An update on FIV and FeLV test performance using a Bayesian statistical approach. Vet Clin Pathol 36, 141-147. Polas PJ, Swenson CL, Sams R, et al (1990): In vitro and in vivo evidence that the antiviral activity of 2',3'- dideoxycytidine is target cell dependent in a feline retrovirus animal model. Antimicrob Agents Chemother 34, 1414–1421. Quigley JG, Burns CC, Anderson MM, Lynch ED, Sabo KM, Overbaugh J, Abkowitz JL (2000): Cloning of the cellular receptor for feline leukemia virus subgroup C (FeLV-C), a retrovirus that induces red cell aplasia. Blood 95, 1093-1099. Reinacher M (1987): Feline leukemia virus-associated enteritis–a condition with features of feline panleukopenia. Vet Pathol 24, 1-4. Reinacher M (1989): Diseases associated with spontaneous feline leukaemia virus (FeLV) infection in cats. Vet Immunol Immunopathol 21, 85. Reinacher M, Theilen G (1987): Frequency and significance of feline leukemia virus infection in necropsied cats. Am J Vet Res 48, 939-945. Robinson A, DeCann K, Aitken E, Gruffydd-Jones TJ, Sparkes AH, Werret G, Harbour DA (1998): Comparison of a rapid immunomigration test and ELISA for FIV antibody and FeLV antigen testing in cats. Vet Rec 142, 491-492. Rogers R, Merigan TC, Hardy Wd, Jr, et al (1972): Cat interferon inhibits feline leukaemia virus infection in cell culture. Nature New Biol 237, 270–271. Rojko JL, Hoover EA, Mathes LE, Olsen RG, Schaller JP (1979): Pathogenesis of experimental feline leukemia virus infection. J Natl Cancer Inst 63, 759-768. Rojko JL, Hoover EA, Quackenbush SL, Olsen RG (1982): Reactivation of latent feline leukaemia virus infection. Nature 298, 385-388. Russell PH, Jarrett O (1978): The specificity of neutralizing antibodies to feline leukaemia viruses. Int J Cancer 21, 768-778. Sand C, Englert T, Egberink H, Lutz H, Hartmann K (2010): Evaluation of a new in-clinic test system to detect feline immunodeficiency virus and feline leukemia virus infection. Vet Clin Pathol 39, 210-214. Sandler I, Teeger M, Best S (1997): Metastatic vaccine associated fibrosarcoma in a 10-year-old cat. Can Vet J 38, 374. Sarma PS, Tseng J, Lee YK, Gilden RV (1973): Virus similar to RD114 virus in cat cells. Nat New Biol 244, 56-59. Scarlett JM, Pollock RV (1991): Year two of follow-up evaluation of a randomized, blind field trial of a commercial feline leukemia virus vaccine. J Am Vet Med Assoc 199, 1431-1432. Scott DW, Schultz RD, Post JE, Bolton GR, Baldwin CA (1973): Autoimmune haemolytic anemia in the cat. J Am Anim Hosp Assoc 9, 530-547. Silva CP, Onuma SS, de Aguiar DM, Futra V, Nakazato L (2016): Molecular detection of Feline Leukemia Virus in free-ranging jaguars (Panthera onca) in the Pantanal region of Mato Grosso, Brazil. Braz J Infect Dis 20, 316-317. Soe LH, Devi BG, Mullins JI, Roy-Burman P (1983): Molecular cloning and characterization of endogenous feline leukemia virus sequences from a cat genomic library. J Virol 46, 829-840. Sparkes AH (2003): Feline leukaemia virus and vaccination. J Feline Med Surg 5, 97-100. Stuetzer B, Brunner K, Lutz H, et al (2013): A trial with 3'-azido-2',3'-dideoxythymidine and human interferon-alpha in cats naturally infected with feline leukaemia virus. J Feline Med Surg 15, 667–671. Sukhumavasi W, Bellosa ML, Lucio-Forster A, Liotta JL, Lee AC, Pornmingmas P, Chungpivat S, Mohammed HO, Lorentzen L, Dubey JP, Bowman DD (2012): Serological survey of Toxoplasma gondii, Dirofilaria immitis, Feline Immunodeficiency Virus (FIV) and Feline Leukemia Virus (FeLV) infections in pet cats in Bangkok and vicinities, Thailand. Vet Parasitol. 188, 25-30. Swenson CL, Polas PJ, Cheney CM, et al (1991): Prophylactic and therapeutic effects of phosphonoformate against feline leukemia virus in vitro. Am J Vet Res 52, 2010–2015. Tandon R, Cattori V, Gomes-Keller MA, Meli ML, Golder MC, Lutz H, Hofmann-Lehmann R (2005): Quantitation of feline leukaemia virus viral and proviral loads by TaqMan real-time polymerase chain reaction. J Virol Methods 130, 124-132. Tandon R, Cattori V, Willi B, Meli ML, Gomes-Keller MA, Lutz H, Hofmann-Lehmann R (2007): Copy number polymorphism of endogenous feline leukemia virus-like sequences. Mol Cell Probes 21, 257-266. Tartaglia J, Jarrett O, Neil JC, Desmettre P, Paoletti E (1993): Protection of cats against feline leukemia virus by vaccination with a canarypox virus recombinant, ALVACFL. J Virol 67, 2370-2375. Tavares L, Roneker C, Johnston K, et al (1987): 3'-Azido-3'-deoxythymidine in feline leukemia virusinfected cats: a model for therapy and prophylaxis of AIDS. Cancer Res 47, 3190–3194. Tavares L, Roneker C, Postie L, et al (1989): Testing of nucleoside analogues in cats infected with feline leukemia virus: a model. Intervirology 30, Suppl 1, 26–35. Temin HM, Mizutani S (1970): RNA-dependent DNA polymerase in virions of Rous sarcoma virus. Nature 226, 1211-1213. Tenorio AP, Franti CE, Madewell BR, Perdersen NC (1991): Chronic oral infections of cats and their relationship to persistent oral carriage of feline calici-, immunodeficiency, or leukaemia viruses. Vet Immunol Immunopathol 29, 1-14. Teske E, van Straten G, van Noort R, Rutteman GR (2002): Chemotherapy with cyclophosphamide, vincristine, and prednisolone (COP) in cats with malignant lymphoma: new results with an old protocol. J Vet Intern Med 16, 179-186. Torres AN, O'Halloran KP, Larson LJ, Schultz RD, Hoover EA (2010): Feline leukemia virus immunity induced by whole inactivated virus vaccination. Vet Immunol Immunopathol 134, 122-131. Vail DM, Thamm D (2005): Hematopoietic tumors. In: Textbook of Veterinary Internal Medicine, Ettinger SJ, Feldman EC (eds), 732-747, Elsevier Saunders, Missouri. Vail DM, Moore AS, Ogilvie GK, Volk LM (1998): Feline lymphoma (145 cases): proliferation indices, cluster of differentiation 3 immunoreactivity, and their association with prognosis in 90 cats. J Vet Intern Med 12, 349-354. Valli VE, Jacobs RM, Norris A, Couto CG, Morrison WB, McCaw D, Cotter S, Ogilvie G, Moore A (2000): The histologic classification of 602 cases of feline lymphoproliferative disease using the National Cancer Institute working formulation. J Vet Diagn Invest 12, 295-306. Vedbrat SS, Rasheed S, Lutz H, Gonda MA, Ruscetti S, Gardner MB, Prensky W (1983): Feline oncornavirus-associated cell membrane antigen: a viral and not a cellularly coded transformation-specific antigen of cat lymphomas. Virology 124, 445-461. Weijer K, UytdeHaag FG, Jarrett O, Lutz H, Osterhaus AD (1986): Post-exposure treatment with monoclonal antibodies in a retrovirus system: failure to protect cats against feline leukemia virus infection with virus neutralizing monoclonal antibodies. Int J Cancer 38, 81-87. Wilson St, Greenslade J, Saunders G, Holcroft C, Bruce L, Scobey A, Childers T, Sture G, Thompson J (2012): Difficulties in demonstrating long term immunity in FeLV vaccinated cats due to increasing age-related resistance to infection. BMC Vet Res 8, 125. Zeidner NS, Myles MH, Mathiason-duBard CK, et al (1990b): Alpha interferon (2b) in combination with zidovudine for the treatment of presymptomatic feline leukemia virus-induced immunodeficiency syndrome. Antimicrob Agents Chemother 34, 1749–1756. Zeidner NS, Rose LM, Mathiason-duBard CK, et al (1990a): Zidovudine in combination with alpha interferon and interleukin-2 as prophylactic therapy for FeLVinduced immunodeficiency syndrome (FeLVFAIDS). J Acquir Immune Defic Syndr 3, 787–796. Zeidner NS, Strobel Jd, Perigo NA, et al (1989): Treatment of FeLV-induced immunodeficiency syndrome (FeLV-FAIDS) with controlled release capsular implantation of 2',3'-dideoxycytidine. Antiviral Res 11, 147–160. Zhu Y, Antony JM, Martinez JA, et al (2007): Didanosine causes sensory neuropathy in an HIV/AIDS animal model: impaired mitochondrial and neurotrophic factor gene expression. Brain 130, 2011–2023. Lutz H, Addie D, Bélak S, Boucraut-Baralon C, Egberink H, Frymus T, et al (2009): Feline leukaemia. ABCD guidelines on prevention and management. J Feline Med Surg 11, 565-574.